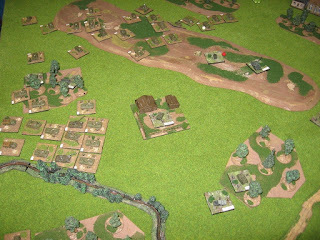 Wargamingnz: Dielingdorf Ridge .. a tale of two plans!! Dielingdorf Ridge .. a tale of two plans!! "So why the hell are we up here then, eh?" "We just do as we're told." "Yeah, but any bleeding moron can see this bloody ridge isn't going to hold with us stuck up the snout like a blooming bogie waiting to be wiped off'. "You'll get yourself into more mischief if you don't shut up, Taffy." Trooper Jones sniffed lustily and re-settled his headphones more comfortably across his beret and around his ears, a streak of blond hair poking from beneath his beret. "Yeah but look at it boyo. This bloody ridge points right at the bloody Soviets. When they come, we're gonna be at the sharp end, nothing surer. And here's us poked right out in front of the rest of the Brigade. Why so far forward, that's what I can't figure. No support, nothing." "The boss'll have a plan, Taffy." "And I have a funny feeling us dying is a part of that f***n' plan too". The Brigadier did indeed have a plan. Defend forward on the left at the tip of the Dielingdorf Ridge furthest away from Dielingdorf itself. 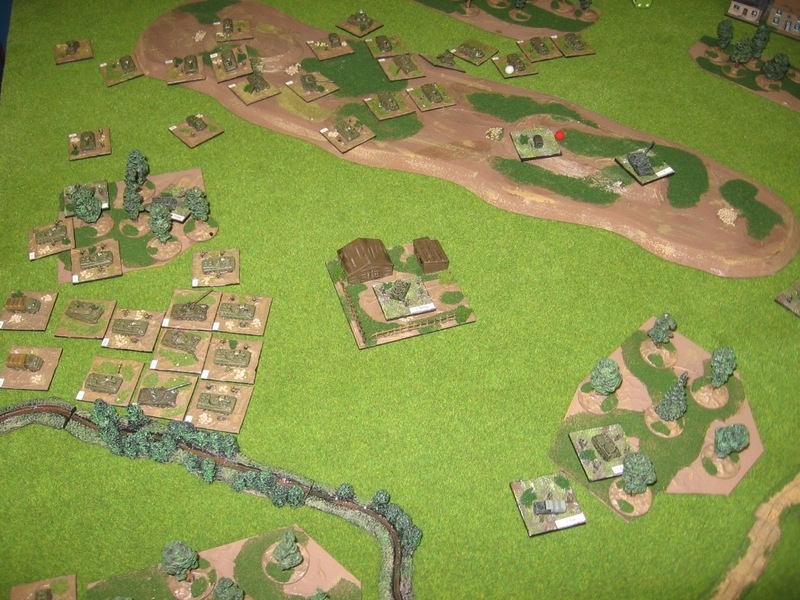 Leave several heights undefended on the right as bait for the Soviet commander who would advance into a hail of fire in a deadly killing zone covered by Chieftains, Swingfire and Milan teams. 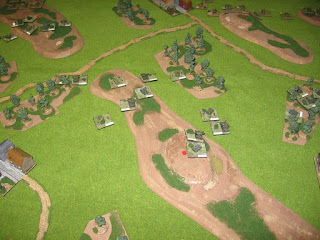 However the Soviet commander didn't take the bait, pushing a single motorised battalion into the empty space on the Brigade right. Instead he attacked in strength on his right against the protruding Brigade left at the tip of the Dielingdorf Ridge. "0A this is 11A contact tank wait out". Jones jumped in his seat. Another message came in just as quick. "0A this is 12C contact infantry wai...."
"Holy f**k" from Jones, "Here they come." 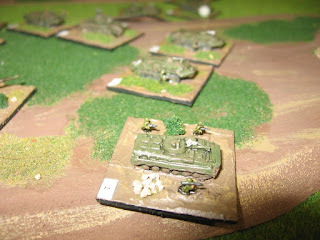 Two Soviet motorised battalions could be seen emerging through the early morning haze to the front of 1 Battalion. FV432 engines burst into life, Chieftain engines rumbled and crews sat in their turret down positions awaiting the first opportunities to engage an advancing enemy. 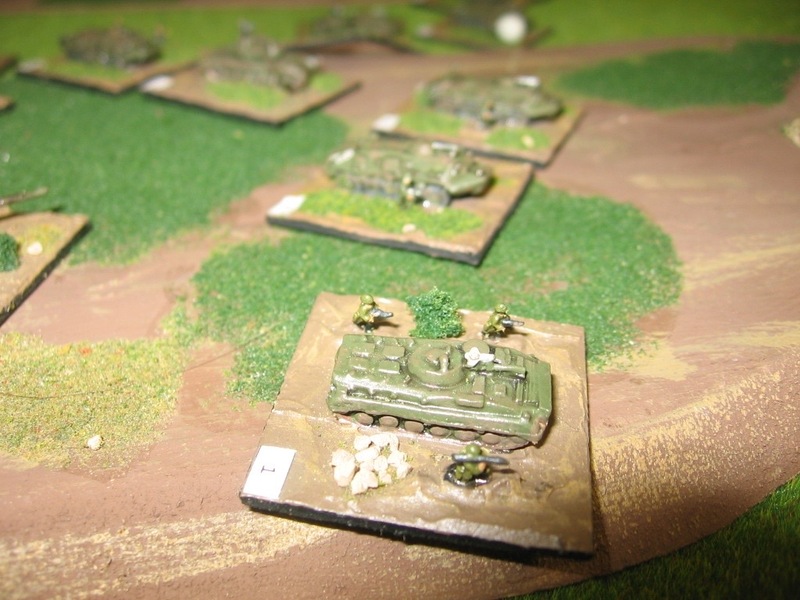 The Royal Artillery observer was the first to draw blood, bringing down fire from his attached Abbot battalion, disabling a platoon of BTRs and forcing another to debuss and go to ground. 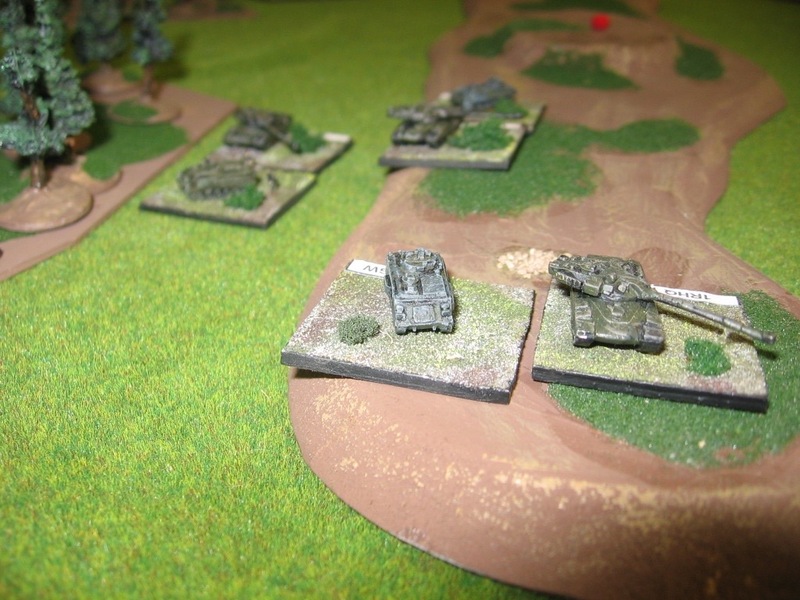 One of the battalion's Milan platoons sent it's first barrage of missiles away, with a T64 platoon left smoking in the fields to the east of Dielingdorf Ridge. Initially the position stayed strong, the Abbot battalion providing valuable fire support. The initial salvoes from the Milan and Chieftain platoons however didn't do the damage they should, and the Soviet advance continued. 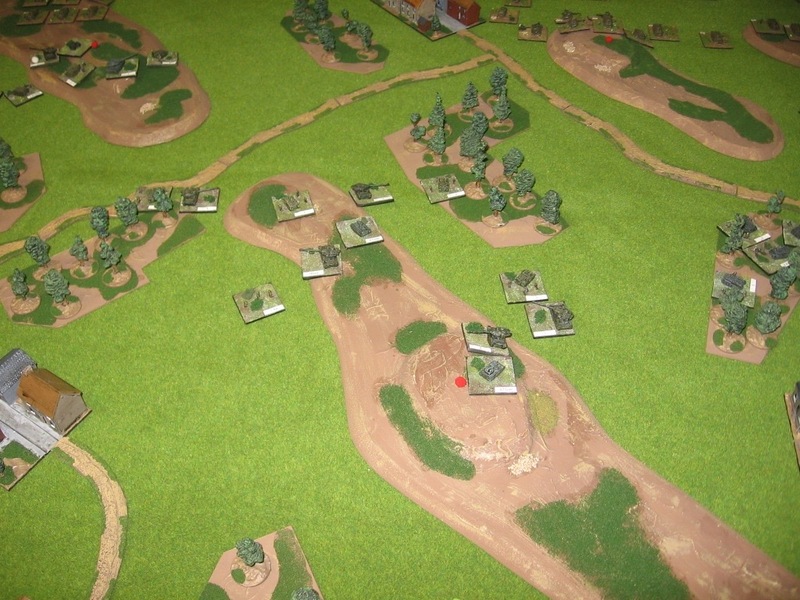 Gaps appeared amongst the advancing Soviet platoons. 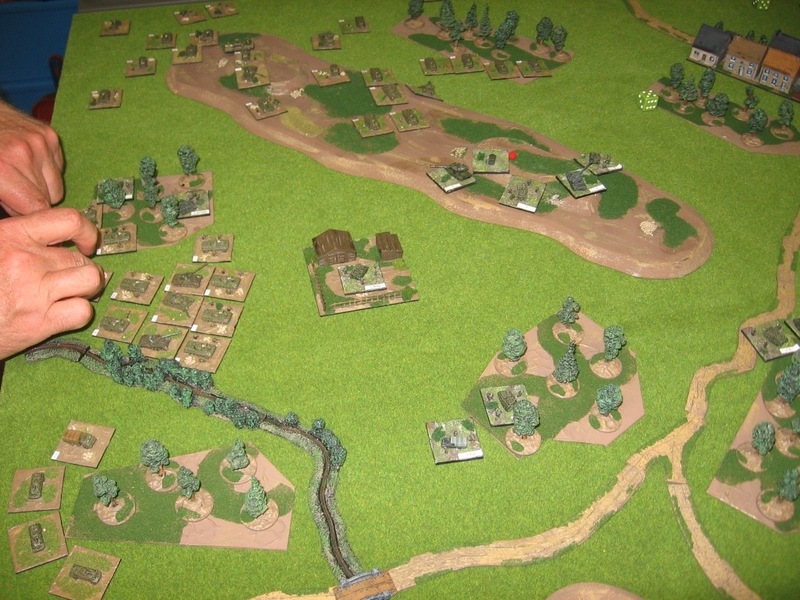 Suddenly gaps appeared in the Battalion position, a combination of casualties from direct fire and artillery support. Swift British counter battery response silenced a battalion of SPG 152s, but they had already done damage to the defending combat teams. 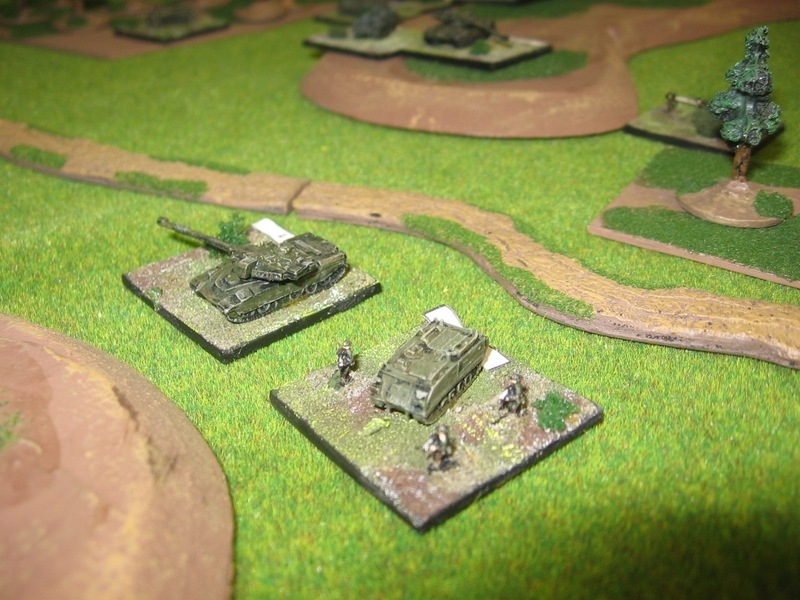 And then the final ignominy as a third Soviet battalion swept onto the exposed flank of the brigade position. The Brigadier's plan had been completely unhinged. The armoured regiment holding the Brigade's centre on the southern half of Dielingdorf Ridge had been ordered to shift position to counter attack the major Soviet advance against 1 Battalion. But the damage had been done. 1 Battalion was unable to hold and the position along the entire ridge was opened up. The Soviet Brigade commander surveyed the scene. Walking forward towards the burning wrecks of several British APCs and Chieftains his glance was drawn to one vehicle in particular in which a crew member had been trapped half out of the driver's hatch of the vehicle. Headsets dangled across his neck and his beret was caught in the cables, a streak of blond hair sticking from his head like a sheaf of wheat at harvest time. This was a game of Modern Spearhead that Keith and played this weekend. It encompassed all that is so good with both the Spearhead rules, and Keith's scenario generation system. The rules pitched plan against plan, and Keith and I have a track record of each trying new ploys to out think the other. In this case I was 'hoist on my own petard' as the Bard said, my overly clever plan failing to tempt Keith into the killing ground I had set for him, and leaving my left flank defending far too far forward, susceptible to the flank march that I had thought wouldn't come. The points system yet again set each of us that familiar dilemma, too few points we thought for the job in hand. Despite a thorough thrashing, still a damned fine game and a great way to spend an evening. 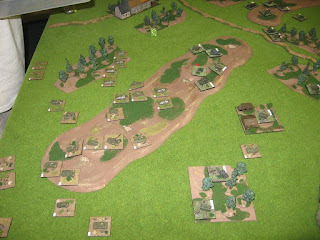 A great report of a very enjoyable game.